TWO YEARS must have seemed like eternity to Rory Gallagher devotees, waiting for the release of 'Photo-Finish'. 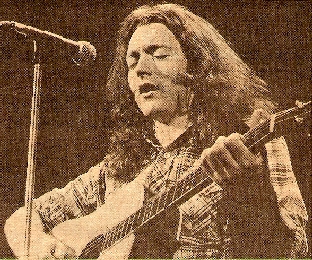 At the outset, recording took place in California, but due to Rory's dissatisfaction and his eventual decision to split the current band, there were subsequent setbacks. The platter, which was ultimately cut in Cologne, West Germany, is no more than average and makes me wonder if it was worth waiting for. That doesn't mean I don't like it, merely disappointed in a guitarist who has become progressively better over the past decade, but fails to go one step further this time around. There are some fine numbers, especially 'Shadow Play', which kicks off the second side. Here is Rory, delivering some exceptional soloing, though sadly not matched elsewhere on the album. A fairly raw, live sound has been attained, seen on tracks like 'Shin Kicker: and 'Brute, Force And Ignorance', and there are Johnny Winter traces present. Apart from 'Shadow Play' and possibly 'Fuel To The Fire', the last song, there aren't really any Gallagher classics. Perhaps a live album, with cuts culled from the past three studio efforts, should be contemplated. Note: The + + + is a rating used by the publication. This one means "Give it a spin".....(Basically giving it a 3 on a scale of 5.) john g.